By Russell H. Conwell. 71 pgs. 5x8. Paperback. ISBN: 0-89540-418-4.ACRES OF DIAMONDS by Russell H. Conwell. Considered by many to be one of the finest speeches ever written, Acres of Diamonds is a lecture that Russell Conwell, founder of Temple University, delivered more than 6,000 times across the country.Through this lecture, Conwell debunks the idea that it is noble to be poor, an idea that far too many of us share. He illustrates that it is our duty as humans to use our gifts to honestly earn riches, because we can do more good with riches than without. 71 pgs. 5x8. Paperback. ISBN: 0-89540-418-4.
by Ann Palmer and Jessica Herman, Introduction by Jerry Apodoca, former Governor of New Mexico. One young woman's story of the devastating effects of the loss of liberty. A True Story, Introduction by Jerry Apodoca, former Governor of New Mexico. 48 pgs. 6x9. Paperback. ISBN: 0-89540-044-8.
by Frank Cheavens. Alvar Núñez. Cabeza de Vaca was the first European explorer to cross the North American continent. His early 16th century wandering took him across Texas, part of New Mexico, southeastern Arizona, and down the west coast of Mexico into South America. His altruistic work and healing ministrations among the Indians of the Southwest drew to him multitudes of Indians who revered him as the Child of the Sun. 194 pgs. 5x8. Paperback. ISBN: 0-89540-161-4. Fixing America: Breaking the Stranglehold of Corporate Rule, Big Media, and the Religious Right. By John Buchanan. "John Buchanan writes with the white heat of a prophet. He has connected the dots and articulated a great warning to this nation: fascism is upon us and democracy is in grave danger. I hope this book is read by Christians, as it clearly also warns that the Church has been co-opted by a theology straight out of Hell." -- Reverend Rich Lang, Trinity United Methodist Church, Seattle, Washington. 263 pgs. 5x8. Pbk. ISBN: 0-89540-436-2.
by William A. Davis. A contemporary tale of the sea. Vivid fast moving satirical yarn, spun on the paradoxical spool of tragicomedy. "Once you start this book there is a high probability that you will not put it down." - Clark Chambers, Critic. 152p. 5x8. Hardback. ISBN: 0-89540-133-9. 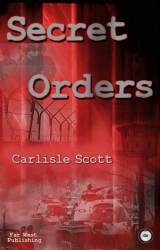 Secret Orders is a novel written by Carlisle Scott about things he witnessed when he was a young soldier with the U.S. Army in the Cold War Germany of the early 1960's. News reporters were kept away from areas where atrocities happened to prevent them from reporting news that could inflame the public and might start a war. Secret Orders is the first novel of its kind to expose these atrocities, which were never previously released to the public. Far West Publishing Co., ISBN: 0-89540-427-3, pp. 258.